Ministry of Propaganda - 06/Jul/2005: "TV-Licensing Update"
It has finally happened, the TV Licensing Enforcers (or whatever they call themselves) have been around. Yes, they have stood outside of my front door. That's as far as they got, because, well, I wasn't at home. So they left me another clueless letter. We have no record of a valid licence for this address. Correct. I think we established that fact something like 18 months ago. That means you could be breaking the law. Possible. Yes, I could be breaking the law. Or I could not be breaking the law. If you had been found using a TV without a licence today, you would have been cautioned and an official interview would have taken place. Hm, any lawyers reading this blog? Isn't cautioning someone something only the police can do? To my knowledge Capita isn't part of the UK Police Force yet. A further visit will be made to your address soon, ... I'll be waiting for you. May be. May be not. 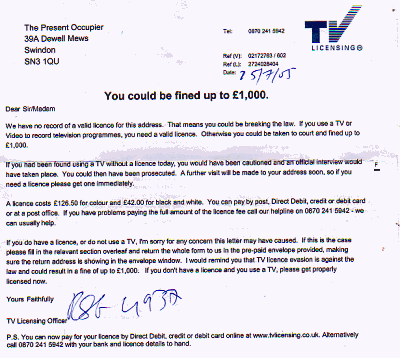 For a moment I thought they finally had got a clue: If you do have a licence, or do not use a TV, I'm sorry for any concern this letter may have caused. Pfft, no you aren't. But I'm sorry that I wasn't at home. Actually, no, I made that last bit up. If this is the case please fill in the relevant section overleaf and return the whole form to us in the pre-paid envelope provided, ... I would do this, honestly, I would. Only one problem here: No pre-paid envelope. And after that anti-climax we return to our regular scheduled programme.